« Fall Sewing Roundup for 2017: Make Something Special! 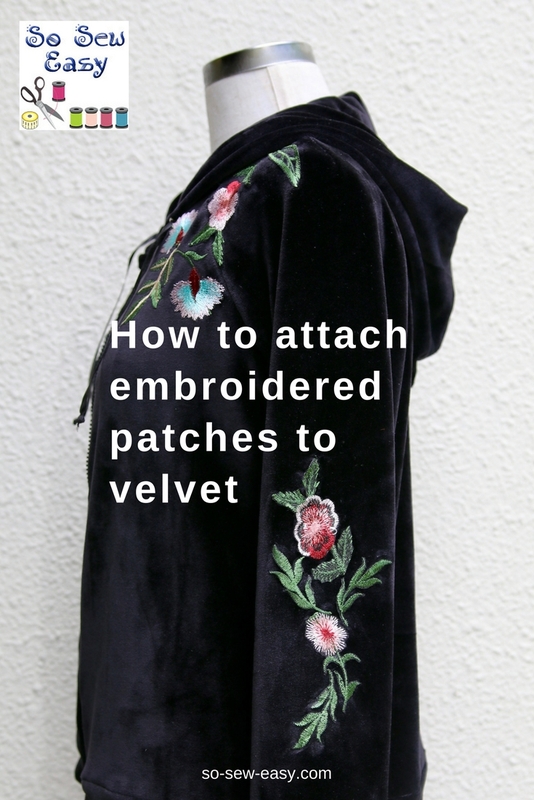 Last week the embroidered hoodie pattern got many of you guessing how to attach embroidered patches to stretchable velvet. I'm sure the advanced sewists out there got the clues immediately after looking at the fabric swatches. For the others, I'm now going to show you how I did it and how you can too. I borrowed this technique from a Japanese quilting designer Masako Wakayama who I meet last year in one of the workshops she taught in Singapore. A gentle lady with a sunny disposition and a lovely patchwork technique that goes back hundreds of years, but her ability to design a scenery on a quilt is nothing less than extraordinary. She has written ten books and I'm lucky to have one autographed by her. Although the book is in Japanese, thankfully her class was in English and it allowed me to understand how this quilting technique can be used in other ways. Find a fabric where you can isolate a flower or a cluster of flowers you like and can use it as an interesting detail on the garment. I have marked in yellow the flowers that I am planning to use. Using a sharp pair of pointy scissors, cut away the pieces you want to use. 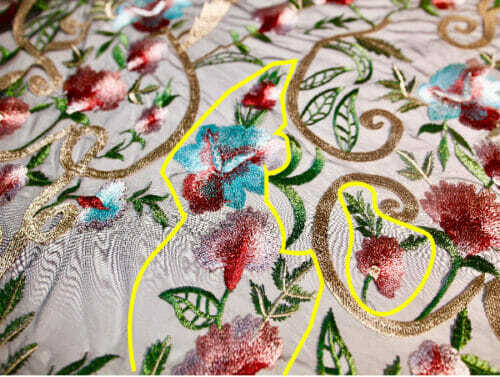 Cut at least 1/8″ (3-5mm) from the edge of the embroidery. 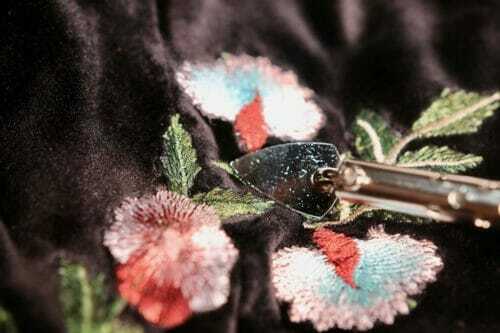 Sometimes you will have to get very close, but try not to cut the threads that make up the embroidery. Place the patch on the rough side of the Heat and Bond. Pin the embroidered patch down on the Heat and Bond. Place a cloth on your ironing board and turn the embroidered patch upside down and iron. Cut away the excess tulle getting as close as possible to the embroidered patch. Peel the backing of the patch and place it where ever you like on the velvet. I have cut away a few flowers from the embroidery and played around with the composition to achieve the “look” I am looking for. I want to have some flowers but not make it look overwhelming. Please see the picture below. 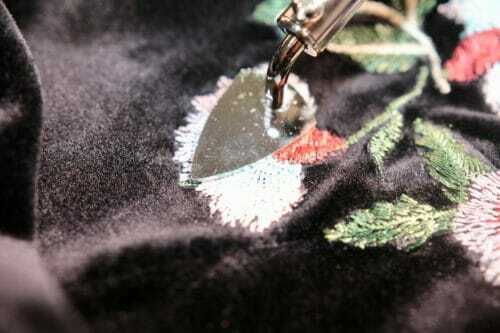 To make the glue melt on the velvet you need to use the tip of the iron and no bigger. 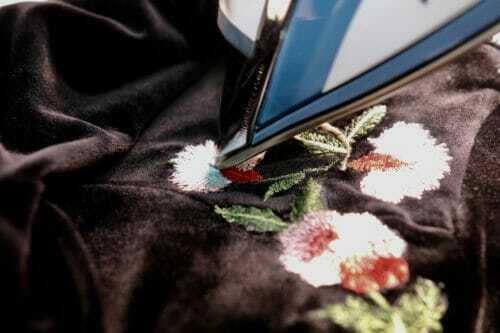 The iron is going to make ugly marks on the velvet and ruin your project so be careful. Velvet is a pile fabric and the heat of the iron will flatten, or worse, melt the fibers. 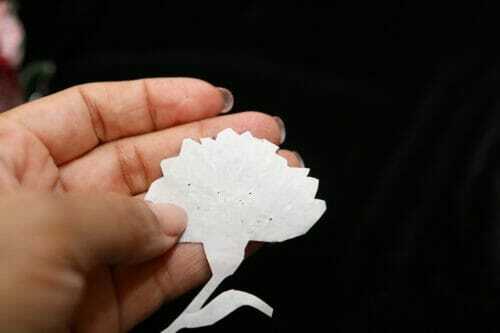 Place a Teflon or cotton fabric to prevent the fibers around the patch from melting. Taking this precaution is what's going to give your garment the machine embroidered look and no one will believe it is a patch. Iron in the middle of the patch until is it glued down. Take the cloth away and iron the edges very carefully. Using just the tip of the iron will take time to glue the patch on the velvet, but it is good enough to finish the job. A better tool and one developed for this same purpose is the mini iron by Clover. The tip and the edges are ideal for melting the glue and bonding the embroidered patch by getting in the smallest corners. The heat and bond glue backing may still not be enough to make the embroidered patches stay on the velvet because of the pile fibers. 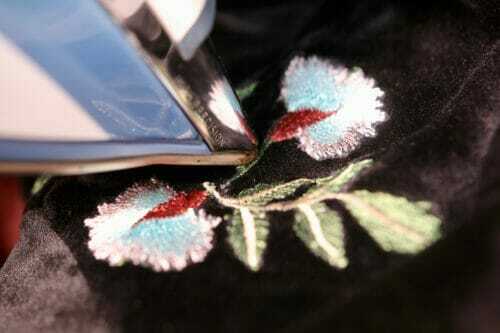 In this case, use a hand needle and invisible threat to sew around the embroidered patches. As you change the thread from patch to patch you may want to zap the thread with your Thread Zapper to avoid the tale of the thread scratching your skin. If you don't have one of these handy tools, please check out the link below. Here's how the patches look from the inside of the garment. 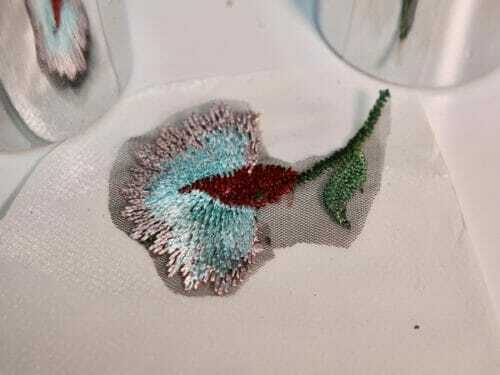 After cutting the flowers from the tulle, use a transparent drying fabric glue to attach the embroidered patch to the velvet. I prefer to use E6000 because it dries transparent and flexible. Leave the embroidered patches to dry overnight, the last thing you will want is the patches moving around when you are sewing them. 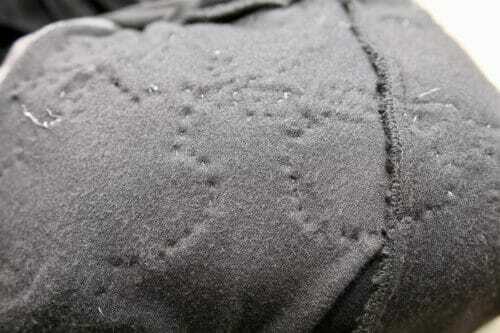 Use the invisible thread to sew around the patches. This is just a precaution since the glue will be strong enough to keep the embroidered patches down. And that's it! I hope you enjoyed learning this new technique for how to attach embroidered patches. Please feel free to share pictures of your work in the comments below. I'd really love to see it. On the velvet cloth, the patches look good and spectacular. I Read your blog, and I got a lot of excellent and valuable information from your blog. 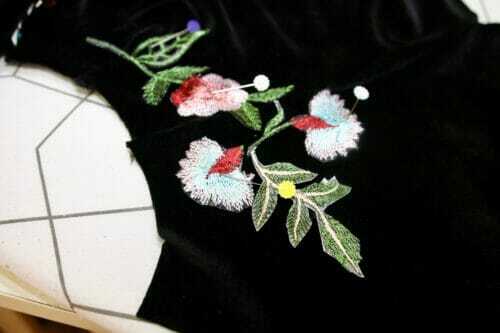 I like the patch on the clothes, and you have elaborated well how to put a patch on the velvet cloth. Thanks for sharing the great information. Good Luck! This method sure beats doing embroidery directly onto the garment. Then 2/3 of the way through the application messes up big time. Thank you . Why? What happened? Did you work with a big iron? Very interesting but I did not see the link to Thread Zapper. Thank you so VERY much. 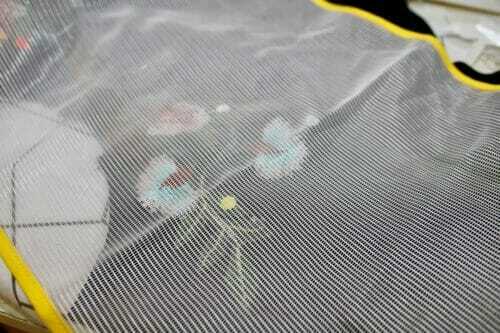 I’m not quite sure when / how you affix the flowers to the tulle. I must need more coffee this morning. I do thank you so VERY much for this lovely idea. Hi Brenda, you have to buy embroidered flowers. But the question you are asking is one I have been thinking about. 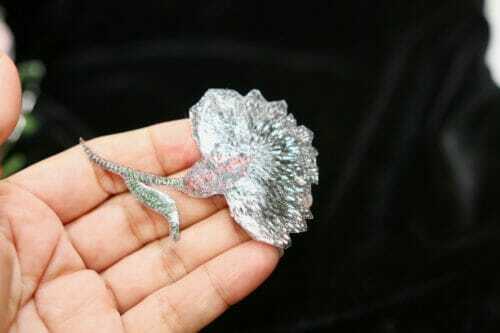 I will be buying stabilizer to see try to embroidered tulle and see if I am successful. I have not done it but have seen embroidery done on tulle just this weekend at a workshop – the results were amazing. The person who did it used tulle and two layers of water soluble stabilizer, one on top and one on bottom and did this to make patches. I bought tulle on the way home so when I get a chance I can try. Hi Sue, thanks for letting me know. Please feel free to leave a pic of how your work turns out. I’d love to see it. Sorry – I just found out it is 2 layers of tulle and one of stabelizer (in video on YouTube – about half way through it is mentioned https://www.youtube.com/watch?v=aRfPgO6WDZk&list=PLKulQp8bMEXTEBgXM2PGJ8rq65iaeD8N8) When I try it I will post a pic – not sure when I will get to it – too many ideas, too little time! I am making this hoodie on my embroidery machine. Very excited about making it. My only question is where do I find the sizing chart? Hi Sheryl. I have placed finished measurements, they are under the Pattern Download section.